AMD hopes to have a big second half in 2013, launching three new CPUs featuring integrated graphics that perform on par with the company’s discrete GPUs. On Thursday, AMD revealed key details of these next-generation mobile chips, code-named Temash, Kabini, and Richland. In a briefing in advance of the announcement, AMD vice-president John Taylor explained how the new chips leverage a number of firsts in AMD’s history: The first CPU with an onboard memory controller, the first dual-core CPU, and the first CPU with an on-die GPU. These are interesting achievements, but it's worth noting that AMD hasn’t bested Intel in the CPU market since 2006. That's the year Intel introduced the first generation of its Core microarchitecture, and pulled ahead. AMD has performed better in the discrete GPU market, frequently trading the number one spot in the graphics space with arch-rival Nvidia. And now the company is looking to that GPU effort to catch up to Intel in the mobile CPU market. This block diagram shows how AMD's new APUs are structured. AMD's new Temash lineup is designed for tablets, hybrids, and notebooks with screens smaller than 13 inches. Intel’s CPUs have integrated graphics, too, but Intel’s GPU doesn’t reside on the same die. Instead, Intels' integrated GPU merely resides in the same package as the CPU, and it doesn’t come close to the performance of a discrete graphics processor. AMD’s processors have had truly integrated graphics since 2011, when the company launched its Llano series of CPUs. The company shipped its second generation of APUs—the Trinity family—just 12 months ago. Temash is an ultra-low-power SoC (system-on-chip) design that combines either two or four of AMD’s “Jaguar” x86-compatible cores; 128 Radeon 8000-series graphics cores; and core logic to support up to eight USB 2.0 ports and two USB 3.0 ports, an SD card reader, and a second-generation SATA controller. 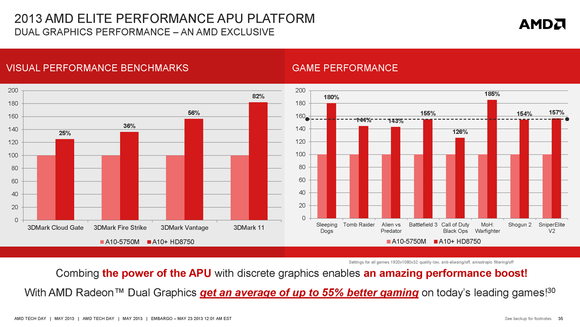 AMD boasts Temash will deliver better graphics than any competing SoC. 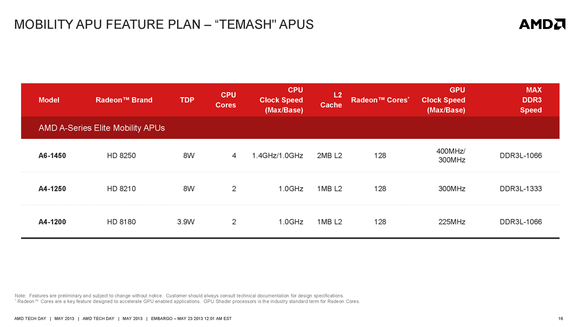 Temash will be available in three models: The A4-1200 is a 1.0GHz dual-core processor with an integrated Radeon HD 8180 graphics processor running at 225MHz, and boasting a TDP (thermal design power of just 3.9 watts. TDP defines the maximum amount of electrical power that a computer’s cooling system is required to dissipate. Everything else being equal, the lower the TDP, the longer a mobile device can operate on battery power. The A4-1250 is also a dual-core 1GHz dual-core processor, but it offers an integrated Radeon HD 8210 processor running at 300MHz and has a TDP of 8 watts. The top-end A6-1450 APU is a quad-core part that runs at 1.0GHz (with a top clock rate of 1.4GHz) featuring a Radeon HD 8250 running at between 300- and 400MHz. This chip can access up to 2MB of cache, where the two lesser parts are limited to 1MB. The A4-1200 and A4-1450 support DDR3 memory speeds up to 1066MHz. The mid-range A4-1250 supports DD4 memory speeds up to 1333MHz. AMD says Temash will not only outperform Intel’s current Atom SoC (Clovertrail), but that it will also be superior to Intel’s upcoming Baytrail part in the tablet and hybrid market. AMD says Temash will also be competitive with Intel’s Celeron and Pentium CPUs in the small-screen (less-than 13 inches) touch notebook market. 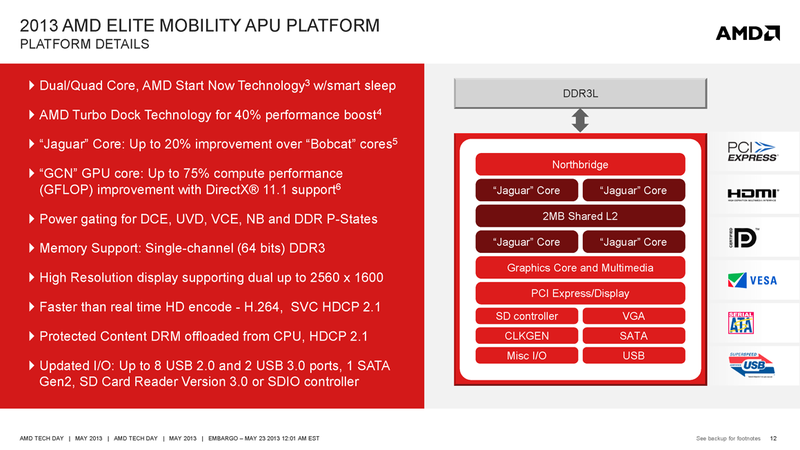 AMD also unveiled three new SoC families—collectively codenamed Kabini—designed for mainstream thin-and-light notebooks. Taylor said the company expects its dual-core E-Series chips to compete with Intel’s Celeron processors, its quad-core A4-Series to best Intel’s Pentium offerings, and its quad-core A6-Series to beat Intel’s Core i3 lineup. AMD is boasting these processors will be capable of delivering 10 hours of resting battery life, nine hours of web browsing, and more than six hours of 1080p video playback. 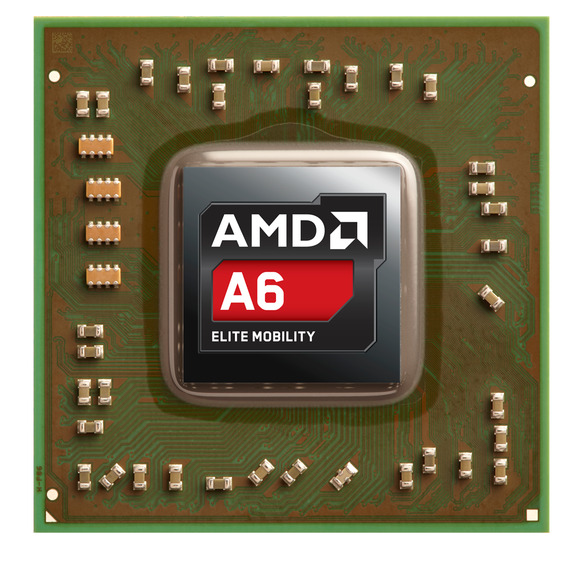 AMD announced six members of its Kabini family of APUs. All five processors will feature 128 Radeon cores, although the number of active cores will vary according to the SKU. The top-of-the-line 2.0GHz A6-5200 has four x86-compatible “Jaguar” cores and an integrated Radeon HD 8400 GPU running at 600MHz. It will support up to DDR3/1600 memory and boast a TDP of just 25 watts. The 1.5GHz A4-5000 is also a quad-core part with support for DDR3/1600 memory. It features an integrated Radeon HD 8330 GPU running at 500MHz, but its TDP is even lower at 15 watts. 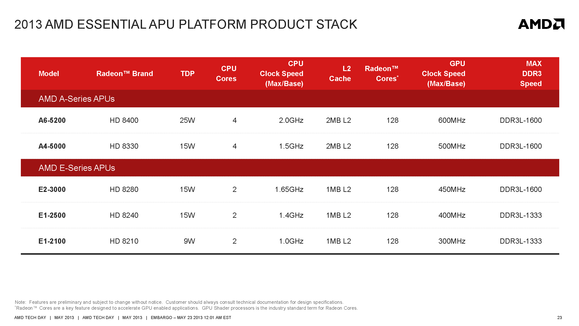 There are three new dual-core APUs in AMD’s E-Series: The 1.4GHz E1-2500 and the 1.65GHz E2-3000 have TDPs of 15 watts, while the E1-2100 will have a TDP of just nine watts. 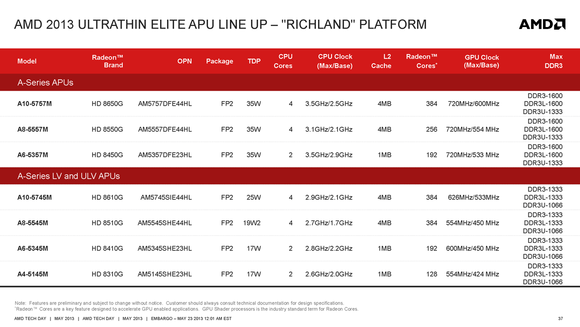 The top tier of AMD’s new mobile product offerings is code-named Richland, and will be branded as the A8 and A10 series at retail. AMD says these APUs will deliver 71 percent better graphics performance than Intel’s Core i5, and that the laptops they power will be capable of more than 10 hours of resting battery life and more than 7.5 hours of web browsing. AMD's Screen Mirror technology will enable a notebook to stream video to another display, such as an HDTV. 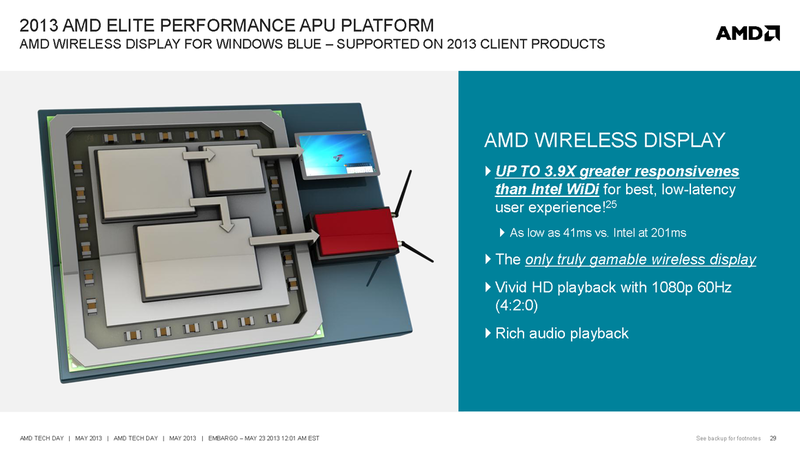 These chips will also be bundled with several AMD technologies: AMD Face Log-in (a security feature that uses facial recognition and an a webcam instead of a password to log you into your computer); AMD Gesture Control (software that enables you to control your computer with hand gestures); and AMD Screen Mirror (hardware and software for wirelessly streaming video from the PC to another display, such as an HDTV). Screen Mirror, a feature similar to Intel’s Wi-Di technology, will also be available on the A6 processor. AMD is targeting gamers with the A10 and will offer bundles of free games with that chip. The Richland family will be AMD's best mobile APUs for 2013. AMD didn’t announce any design wins when their embargo lifted, but MSI Computer Corp. jumped the gun and announced that its refreshed model GX60 and GX70 gaming notebooks will feature AMD's A10-5750M APU (a mobile Richland part). MSI's model GX70-3BE-007US will have a 17.3-inch display, 8GB of DDR3/600 memory, a Blu-ray disc reader, and support for AMD's Eyefinity multi-display technology. MSI's notebook will also be outfitted with one of AMD's discrete mobile GPUs—the Radeon HD 8970M—which will take advantage of AMD's dual graphics feature. Rather than simply shut down the GPU on the APU in the presence of a second processor, the two parts will work together to boost gaming performance. Add one of AMD's discrete GPUs to a notebook powered by an AMD APU, and both components will share the graphics-processing workload. AMD also provided us a photo—but no details—of an apparently unannounced Acer V5-122 notebook. According to this listing on Amazon, the V5-122 is powered by a 1.0GHz dual-core AMD A4-1250 processor, which would mark it as being based on one of AMD’s Temash processors. According to Amazon, the notebook will sell for $500. That’s not a bad price for a three-pound, 0.83-inch-thick Windows 8 notebook, a 10-point-touch display, and 6GB of memory. If AMD can usher in an era of very inexpensive, but highly capable tablets and notebooks, the company will have a success on its hands. The proof will be in the benchmark pudding.